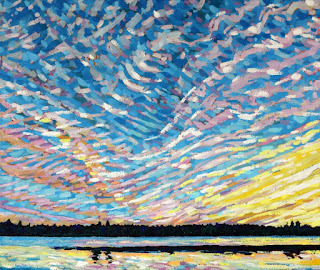 Phil Chadwick's Art: #2065 "Summer Cirrus"
I was out for a mid summer paddle in my kayak. The camera was almost in the water in order to get this ultimate in very low perspectives. I was holding the camera over the side of the kayak and guessing that it was being held horizontally. Ripples along the far western shore and in the western basin of Singleton Lake caused most of the reflections from the sloped sides of those tiny waves to be directed from the sky. The cloud colours can be seen in this rippled reflection but not the shape of the individual clouds. The lake in the shelter of Point Paradise within the eastern basin of the lake was calm. This mirrored surface reflected the tops of the trees on the distant shoreline as well as the clouds in the sky. The taller white pines left of centre along that shoreline identify the point of land that is almost an island in the west basin. This is the point that Farmer Singleton rowed from twice a day to milk the cows that ranged in the pastures of our property. 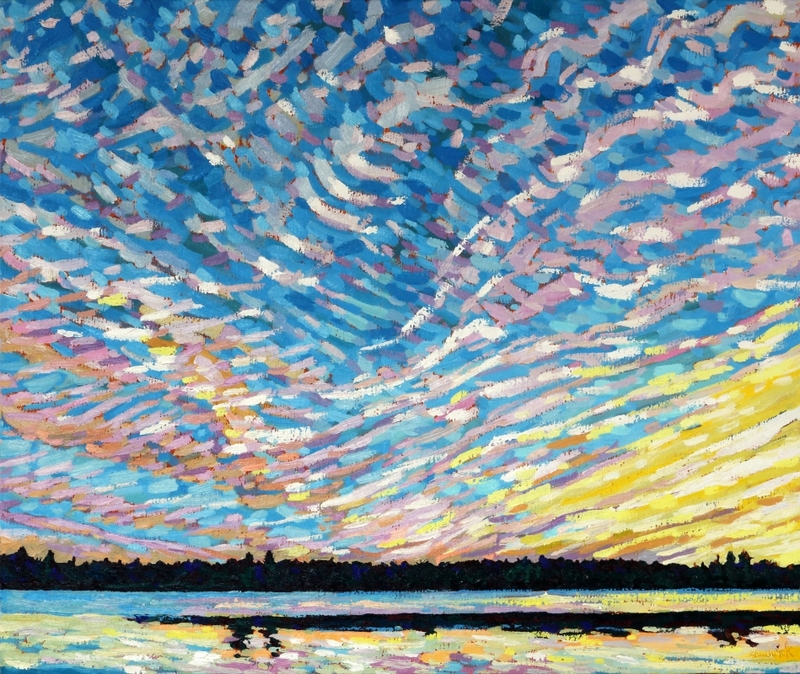 I painted that point in #1714 "White Pine Island" which was based on #1713 "December Morn". The tall white pine on the far right supported the nest of the Singleton osprey. The clouds always have a story to tell but this time it was enough just to enjoy them. However here is what little that I know for certain. Their were several layers of cirrus in this sunset sky but I could not even be certain which layer was higher or lower than the other. 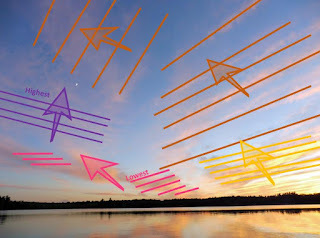 I made an educated guess if the cloud elements were assumed to be the same size but in truth, I cannot be certain. With a knowledge of how the wind changes direction with height one can deduce whether (pun intended) the temperature the next day will be warmer or colder. If the winds turns clockwise with height the next day is apt to be warmer. If the winds turn counter-clockwise with height then temperatures will be colder. The spacing of the cloud bands are also directly related to the wind speed within that layer. Wider spacing means bigger gravity waves and stronger winds just like the waves on a lake. I forget what really happened. In reality it is just another beautiful sunset that I felt needed to be painted. If I had to make a guess though I feel that the winds were backing with height. The winds seemed to turn counter-clockwise right from the northerly breezes over Singleton to the level where the jets fly. Note that the east basin of Singleton stays calm in a northerly flow while the west basin is stirred up by the wind funnelling down Lyndhurst Creek. This would indicate that the next day was going to dawn just a bit cooler. 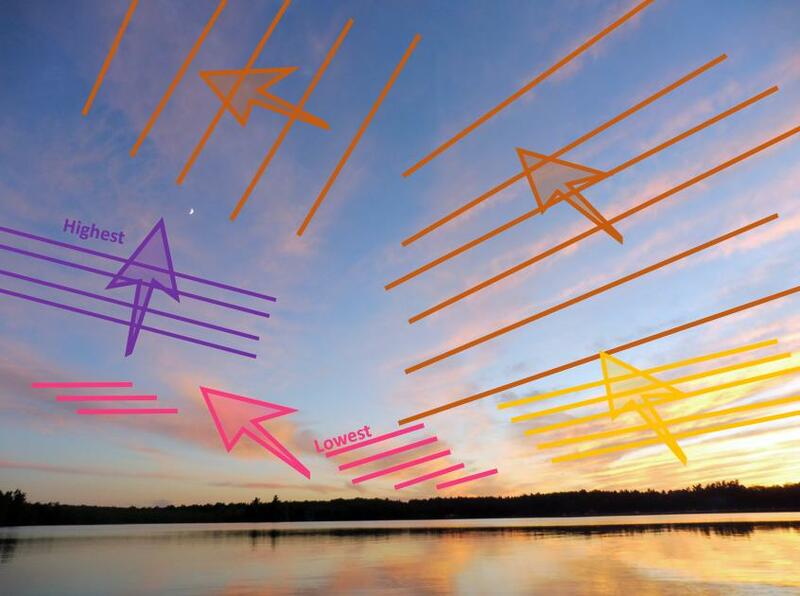 The graphic that I made has the red cirrus and winds at the lowest level followed by the yellow level wind. The brown winds where a bit higher and the southwesterly purple winds were the highest. Regardless what I happened I had a lot of fun with this painting.